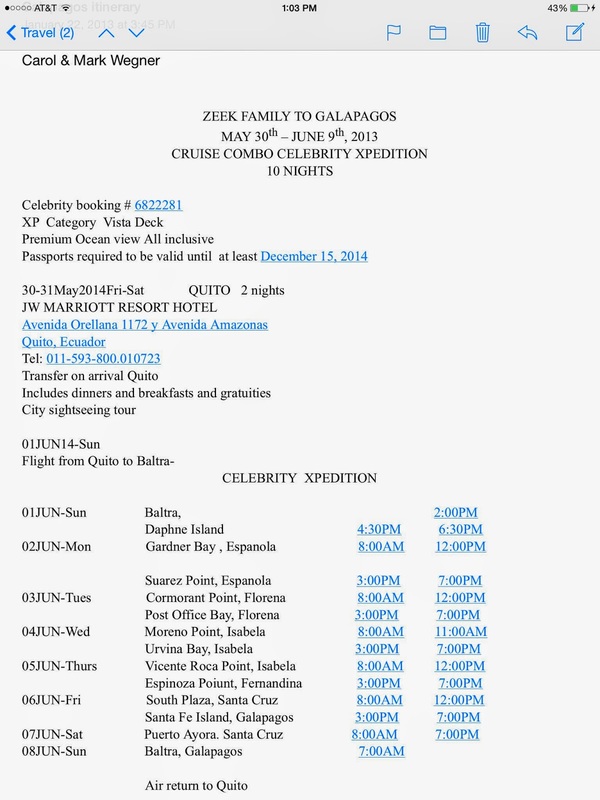 Travels in the Great White: Equador and the Galapagos Islands May 30, 2014-June 9, 2014, a trip without Great White. 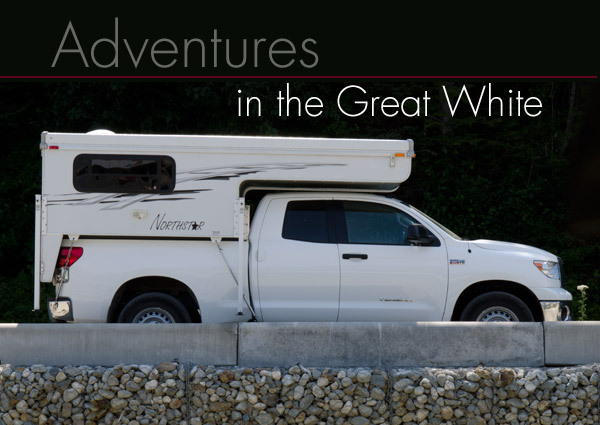 Mark and Carol's travels in their Toyota Tundra 5.7 L. V8 4X4 with a NorthStar TC650 camper. Equador and the Galapagos Islands May 30, 2014-June 9, 2014, a trip without Great White. Awake early anticipating this mornings flight, we had begun planning this trip in January 2013. We spent the night at The Millwood Suites in Millbrae. We left SFO for Houston at 8:41 stopping in Houston for a layover. The hotel was comfy and quiet. The flight was 30 minutes late taking off. We flew south along the coast until reaching Monterry, where we began to travel to the south east. The flight from San Francisco to Houston was comfortable, the seat on the isle was empty, meaning we could stretch out. After an on time arrival in Houston we went to Pappadeaux Sea Food Restaurant for lunch/ dinner. The crayfish soup was as good as I remembered from 11 years ago. The flight for Quito lifted off an hour late and we were very cramped. Somehow the pilot caught a tailwind and made up the time, we were only a few minutes late landing in Quito. The drive to the airport was about 45 minutes. We arrived at the hotel around 12:30 where the weather was 54 and clear. We didn't sleep late considering our late arrival. Being hungry we headed downstairs for the breakfast before setting out to explore. We were able to check in to our room at the Quito Marriot which booked by the cruise before noon. We were pleasantly surprised to find our room had been upgraded to a suite on the 9th floor with a balcony and access to the Executive Lounge and free internet. After settling in our room we headed out for The Teleferico in a taxi. We found the streets of Quito to be extremely busy, with not so curtious drivers. The taxi driver offered to wait while the the Teleferico transported us up the side of Pichincha Volcano to a height of about 4100 meters (~13400 feet). The drive said we would probably be gone about 1 1/2 hours. Once to the top we enjoyed the music of a musician playing a pan pipe, interestingly enough although he looked like he belonged in the Andes the music he played was very North American. The view of Quito and the surrounding area was spectacular. We were lucky to have been here on a clear day. After spending the allotted amount of time wandering around in the higher altitude we were ready to head back down to Quito. As we arrived at the spot where we had left the drive we found another driver who told us our driver had run down to get gas and would return in 5 minutes. We waited...and waited... and waited. As we watched taxi's and visitors come and go the driver kept telling us "5 more minutes. After about 45 minutes the driver finally showed up. His story was he had to go eat lunch. Once back at the hotel we sat down for a cold beer and lunch in the not so great Mexican Restaurant with Mel and Nette. Later we were joined by Gary. After relaxing for a while in our room we met the rest of our group as they returned from the Amazon. The morning began with a buffet breakfast in Bistro Latino Restaurant in the hotel. This gave us the opportunity to sample the local fruits and breakfast specialties. At 9:15 we headed out in buses to Old Town Quito and a city tour. The traffic was once again heavy, we were glad to be on a bus. One stop was at the National Basilica. The gargoyles are animals of the Andes and Galapagos. In Old Town Quito there are 7 churches built within 10 blocks. We visited 3. The churches were built where the indigenous people had built their temples. The insides of the churches also had paintings to trick the indigenous people into believing their gods were represented as they were converted to Catholicism. A silver statue of the Virgin is visible from all over the city, but this is as close as we were able to get. The Cathedral of San Francisco was built in the 16th Century. Products were made and sold there by cloistered nuns. The order consists of 70 Franciscan Monks. We were served lunch at Suchre's Teatro Restaurant. A typical meal of the area was served as a singer sang opera. Lunch consisted of potato soup, plantains, civiche, rice, chicken and empenadas. Dessert was sherbert and cookies. We were able to eat outside on a deck overlooking a small plaza where women were selling woven cotton scarfs. I bought 2 for a total of $5.00. After lunch we headed for the Equatorial Line Monument and Museum. We were able to stand on the equator and feel the uneven pull. They used to have an exhibit that shows the different directional pull on each side of the equator, but that was no longer displayed. We climbed a tower and walked through a museum that depicted the differing cultures of each of the indigenous groups of the area. The shops were pretty much all the same, trinkets for tourists to buy. We did see a restaurant that had a guinea pig roasting on a spit, a delicacy! During the entire tour a security guard accompanied us. Back at the hotel we had an opportunity to rest before being driven to dinner at La Gloria Restaurant where I had delicious civiche with grilled shrimp, veal shank with mashed potatoes, Mark had chicken with rice and mushrooms. Dessert was a sampler plate with creme brulee, pastry with lemon curd filling and berry sorbet. Dinner was lovely! As we left the restuaurant all the workers lined the pathway and applauded for each of us. Back at the hotel, we had to pack our suitcases and have them downstairs to be checked by the Galapagos Agricultural Authorities and transffered to the airlines. Breakfast was served early so we could receive our travel documents at 7:30 and be on the bus on the way to the airport by 8:15. We flew on a very comfortable airbus, AeroGal, chartered by Celebrity. We were even allowed to take water aboard! Once in the air we were given a table cloth to go on our tray. A table cloth for my tray table! After being offered gruel for 7.99 on United, this was a tasty treat! Then came brunch on china with real silverware, even a knife! The flight to the Island of Baltra was about 2 hours. Once there we were herded into the Celebrity Lounge to await or buses to the pangas which would take us to the boat. Once we were to our rooms we were given the first of our daily schedule which charted our voyage. We landed on the Island of Baltra which is a small island between the two in the middle of the map. After all the boat drills and the distribution of snorkel gear we went out on the deck as the boat circled its first island, Daphne Major. This island is a parastic cone of a once active volcano. Lots of choices for dinner each night. A couple of types of beef, chicken, fish, and pasta dishes. Both Mark and I had the Chef's suggestion, Ahi. It was quite large! Dessert was chocolate moose with fresh peaches. Sounded strange, but was delicious. We were back in our room and ready to rest by 9:30. As usual I was up early, before the coffee was out! There were lots of clouds in the sky. I enjoyed the sounds as the boat was motoring towards our destination, Espanola Island. Breakfast was served beginning at 7:00. There were lots of choices each morning. There were always scrambled eggs, sausage, bacon, fruits, cereals, yogurt, cheese, smoked salmon, and a variery of breads and sweet rolls, some mornings there were waffles while others there were crepes. Omelets were also being made to order. This morning we went on a hike, at Gardner Bay on Espanola Island. Espanola Island is the oldest Island in the Archipelago, about 4 million years old. Coming ashore for our first wet landing, we were greeted by a number of sea lions, mommas, daddies and babies sunning themselves on the beach, while others froliced in the water. As we walked along this beautiful white sand beach we encountered many more sea lions, some with wounds form sharks, who didn't even notice us. It felt good to remove the wet sandals and walk barefoot along the beach. After walking the beach we had a welcome opportunity for our first snorkel. As we arrived to don our snorkel gear we found that the sea lions had found our gear a great place to relax. After a long walk the cool water felt great! The crew advised wetsuits, but by California standards the water was quite warm, in the 70's. We forwent the wetsuits and enjoyed the swim. I saw parrot fish and a seal lion sitting on some rocks.